State-of-the-art condensing heat exchangers are characterized by high efficiency, high reliability and low costs. 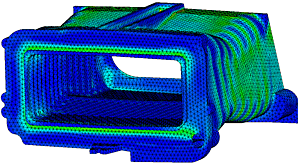 We simulate the relevant physical variables like pressure loss, temperature distributions, heat flux and thermal efficiency. The resulting mechanical stresses are optimized with respect to maximum lifetime. As an example, the top figure shows the temperature distribution for the heat transfer studs flown by flue gas. 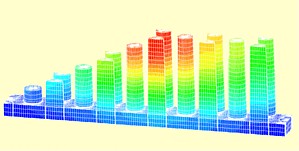 The resulting temperature distribution of the heat transfer studs is shown in the center figure and the bottom figure shows the distribution of stress along the heat exchanger.